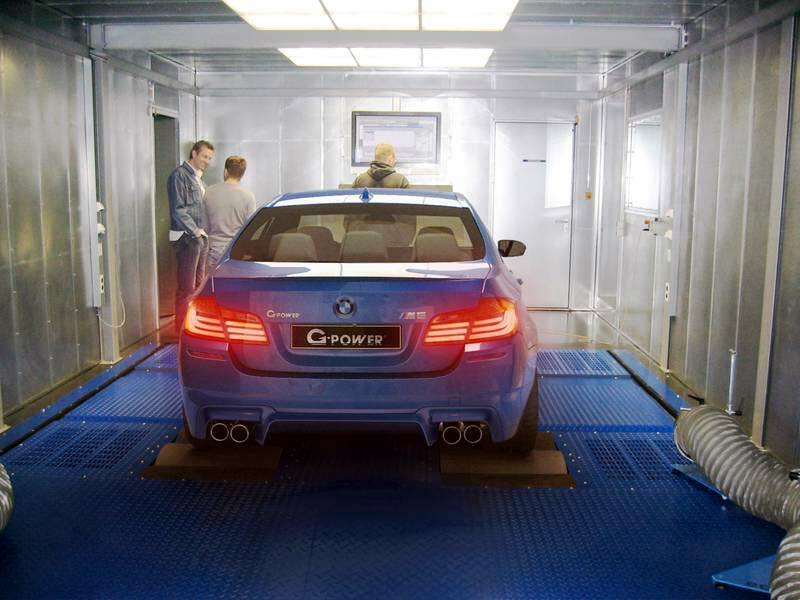 Bayern-based BMW tuning specialist, G-Power, has released this photo of the new M5 in its workshop, along with a few hints of what’s to come. Already producing 412 kW (560 hp) from its 4.4 L twin-turbocharged V8 engine, the F10 version hits 100 km/h (62 mph) in just 4.4 seconds and can reach 305 km/h (190 mph) if equipped with the M Driver’s Package. G-Power says it is already developing new wheels, aerodynamic upgrades and tuning programs resulting in at least 441 kW (600 hp) – for the first stage. Judging by those new tailpipes, lets presume there’s a full high performance system attached to them. Who knows where the later stages could take the M5? For comparison, the company’s X6 M Typhoon churns out 533 kW (725 hp) from its 4.4 L V8.